A great idea for sprucing up your next event are jumping castles – and there are three great places in Brisbane to get the jumping castle that suits both you (and your kids) needs. Jumping Castles Brisbane delivers jumping castles to all Brisbane suburbs, and offers several themes to choose from via a simple ordering process. Also, if you quote special booking number 51726, you can receive $30 cash back on any combination you choose. The 'Jumping J-Jays' different combinations include the jumping room, the ladder, the slide, inflatable walls (rebound), bouncy doorways and punching bags. Additional activities include opening and closing mouth, rising and falling floor, as well as the water pool (please check the website for additional fees). The website also allows you to see the castle in 3D and get the best price on the market before you hire, so check it out. Cheeky Jumping Castles also provides quality jumping castles for younger kids, with various shapes, sizes and themes, including children's favourite characters from Disney, Warner Brothers and Dreamworks. 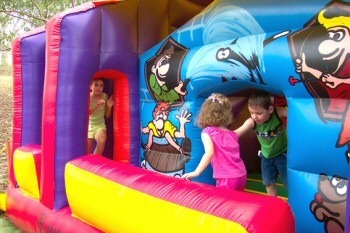 Trained installers are also provided who deliver and install the jumping castle in your backyard/location. They are also available seven days a week, and provide some of the most safest and newest jumping castles around. The website offers pictures of all the jumping castles available, and also allows users to obtain a free quote. Jolly Jumps is offers one of the most diverse range of jumping castles to all locations in Brisbane. As an established business, many people have given great feedback on the quality and affordability of these jumping castles. There are many different jumping castles to choose from, including combination jumping castles, obstacle jumping castles, slide jumping castles, and even 'boxing' jumping castles (see website for more details). There are jumping castles for all ages as well, including toddlers, teenagers and adults, so no one is left out of the fun. So check out Brisbane's biggest and best jumping castles, and make sure you have as much fun as you can at your next special event. Crazy Town Parties is also a great option. They specialize in adult jumping castles and interactive inflatable games (their velcro flywall is so much fun). You can find more info at www.crazytownparties.com. I have personally hired from Jester Entertainment and Jumping J-Jays and would not go anywhere else. Be very wary of netted wall jumping castles; they are extremely dangerous. We had one collapse at a party we attended and it ruined the whole event.